The last time I wrote, at the start of the 2018 season, I made the point that you really need team support and tuition to get the most out of motor racing. Well, at the end of the 2018 season, I can say that’s still true - but what I didn’t realise was how much all this costs. You can’t just take occasional support from a team, you have to commit to a season and basically, let them know how much you’ll be spending with them. If you’re not spending much, you won’t get the setup advice and general support you need for practice and competition..
For example, a race team will know the setups for your type of car at each circuit for the different conditions you’ll meet: dry, hot, cold, wet, etc. They won’t give you those settings unless you take the team along to the race track with you, as this is their intellectual property, and other drivers are paying more for it. That’s all fair enough, but it does leave the lower-budget racer with a problem. You’re either fully committed and spending money to take a least one mechanic to every track day, or you’re not with a team. The only solution I can see to this is to find a race mechanic who will do the setup work with you between track days, and come to the occasional day with you. Or, you can learn the setup yourself and put in a lot of hard work to change the settings during a track day, but that really is hard work after you’ve trailered the car to track and still need to drive the lap times and do the spanner work, and then trailer the car home again, unpack, clean up and prepare for the next track day. Some smaller teams will sell you just awning space and advice at race weekends, but I see that as an essential minimum if you’ve already arranged all the driving practice and learning about setups with your friendly race mechanic. For a season in Ginetta G40 Cup, I believe that most front-runners spend around £50-70k. That gets you storage and preparation of your car, delivery to track days with a mechanic and delivery and support through six race weekends. It also gets you in the region of 10 to 15 track days and tuition, plus consumable parts like tyres and brakes. With that investment in money and time, bearing in mind that most track days are midweek and require a day off work, you’ll get in the top ten at race weekends. If you get involved in crashes, which is highly likely, your repair bill may be another £5-10k on top. Of course, that’s just Ginetta G40 Cup racing. There are cheaper championships to enter, which is the subject of my next post. It's now "year 2" in my transition to motorsport. 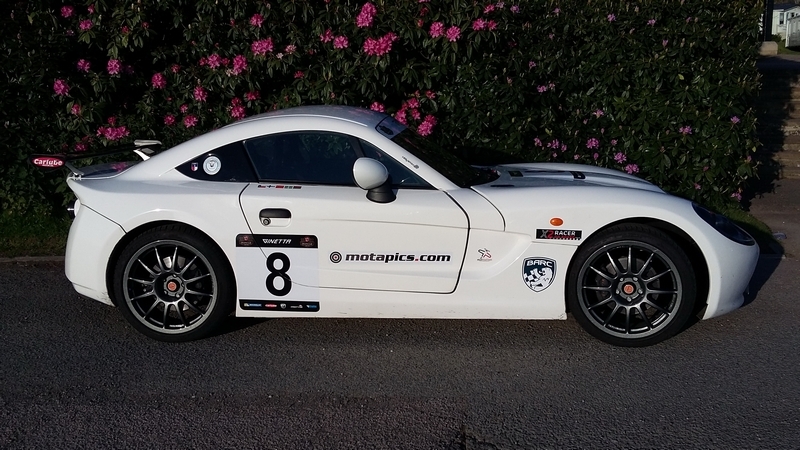 It's just over one year since I bought my Ginetta G40 and started driving it on a couple of track days. I drove it as a road car to the tracks and drove it on the tracks like a road car, with my motorcycle helmet and a pair of jeans and fleece. I knew then that I had a steep learning curve ahead of me. What I didn't realise was how to manage my budget and get the most out of my time and money before the first races. That's what I concluded early on; "I can do this myself". I figured that I'd had some instructors in car with me and didn't get much out of it except confusing messages, so track time on my own was just as valuable. I also figured that the maintenance and set-up is there to learn and implement as with a road car, just with more regular checks. I was right on both counts for a season of learning about motorsport, but if I had known then what I know now... I would have tweaked a few things, saved some time and got more out of the year, although spent a bit more money. As I had always been told, tuition / driver coaching is the best investment you can make. I've now had some proper driver coaching, and learned a huge amount in one day, probably more than I would have learned in ten track standard days. Get the right tutor for your learning style, and listen carefully because you only have a couple of hours in the car over a day, and you really need to apply what he or she is telling you quickly. At the end of the day, take the time to write down what you picked up from the day, such as the three main points. You won't learn it all in a day, but you will learn at least one new thing that you need to keep practising. Get a tutor that you can hear properly. There's nothing worse than trying to drive to on the limit and struggling t hear what a passenger is saying. In my view, if the instructor does not give you an earpiece connected to his microphone, you won't learn anything. Get tutoring on each circuit, not just one. To get as fast as the other guys in your talent range, you'll need one or two tuition sessions on that circuit. Not many corners are the same, even if they are of a similar type (coast to apex, power down through apex, v-shaped, etc.). Each one has a nuance that an instructor can guide you through, and they are slightly different nuances on each corner of each circuit. These finer learning points per circuit will make the difference that you are seeking on a circuit, even if it is just tenths of a second. If you can concentrate on your driving only, by puling into the pits and having your car checked and tweaked, you will be quicker. You get your fuel measured out for the number of laps you are doing. You get your tyre pressures adjusted as soon as you come off track. You get your shocks adjusted while you sit in the car. What could be better for helping you think only about the driving and what the instructor has told you? Of course, this is the ideal scenario and we can't afford it all the time, but now and again, if you can afford it alongside the driver coaching / instruction, it's worth its weight in gold. Setup of the car is also best done by a team on a regular basis. You can still do the basics like oil changes yourself, but you really need a professional team to set up your car geometry and do thorough spanner checks. Things come loose or break on race cars every time you go out, and you won't find them until you spend time looking into every nook and cranny. That's what the race teams do, and it's a lot easier for them because they know what to look for and they have the ramps and tools to make it routine. Here's an example of how lap times can improve with tuition and then setup. I took a day at Snetterton 300 in November where the car was prepared and delivered to track by SVG Motorsport. I also got tuition on the day with Jim Edwards. We started the day on the old Michelin PS3 tyres, in the wet, drying to damp by midday. My previous fastest lap was mid 2:27s, on a track day mid year. After about 20 laps tuition with Jim and the new shocks, my lap times were down to the mid 2:24s. In the afternoon, switching to a few laps on the Avon ZZRs, my lap times improved to the mid 2:23s. This is a 4-second improvement over 3 miles, and compared to my race pace from back in May (2:29), a 6-second improvement, i.e. two seconds a mile. I subsequently did a day in December at Brands Hatch Indy and gained two seconds a lap, from the mid 00:59s to mid 00:57s. At least half of the improvement is down to tuition, putting into practice the two or three points that I picked up from Jim. (1) Tuition with a coach who can teach in a way that suits your learning style is the number one priority, and I should have invested earlier. (2) You can avoid frustration and spins by proper set-up. It really does help with your stability. I feel quite comfortable with the car moving about, as a Ginetta does when not set up to the optimum, but that seems to be wasting potential, even if it is a good learning practice and part of the reason you want "seat time". (3) Spend your money on fewer, quality track days, or a quality track day every other time - where quality means team support and tuition, which may cost you about £1,000. I spent about £5,000 on my whole season last year on track days, race weekend transport and hotels, DIY maintenance and caution at races to avoid damage. By the time the third of four race weekends came along, I was getting disheartened at my lack of pace compared to the other drivers; who used to be the same pace or slower, but who were now quicker. As I've said before, it seems to me that improvement is 80% about time in the car and money available for risking the car in off-track excursions or race incidents. After a ninth and tenth place at the second round at Snetterton, gained by staying out of trouble and not pushing the speed, the third round at Silverstone was a low point. I couldn't find the speed or enthusiasm. I found the Silverstone GP circuit difficult to learn, as it's so long and so wide, with unknown lines to the newbie. I had only been there for a few laps in the early days (my first ever time in a Ginetta in fact, back in November 2016 and in the wet, so lots of spins), and it showed when I turned up for the race weekend, straight into qualifying with no practice day beforehand. I also realised after the race weekend that I'd been having trouble stopping, especially going into Luffield, where it's very easy to spin right in front of the British Racing Drivers' Club (BRDC) building! I hadn't changed my brake fluid since getting the car 3,500 miles ago, and I'd been on eight track days and two race weekends since then. That was a rookie mistake, and I found out the difference in stopping power after I changed the fluid for the next outing at Brands hatch GP. I could lean on the brakes later and know that I would slow enough in time for turn-in. Set-up is important and unfortunately a bit expensive to drivers on a low budget, but should never be ignored. If you don't keep on top of it, you're wasting your time and money for the whole season. The same thing applies to practice at new circuits; you need to spend the money to get time on the circuit, or you're wasting your season. For the final race weekend of our four-weekend, eight-race season, we were going to Brands Hatch GP circuit. This is a rarely opened circuit, and most track days are on the shorter Indy loop of the circuit. Consequently, track days are expensive at the GP, in the region of £500. I was in money saving mode as usual, but my girlfriend told me I was wasting my time if I didn't make the most of the season and buy the track day that was coming up. Well, that was good advice, and I did the RMA track day. I loved the circuit, particularly with new brake fluid and better stopping power. For the final race weekend, I also found a track evening at the Indy circuit and used it to get myself finally under the one-minute lap time by working on a couple of corners. I realised that I had learned a lot during the season, as I was quicker than most cars on the circuit, doing consistent lap times (when traffic allowed) and five seconds quicker on a lap. I was now feeling more positive and looking forward to the final race weekend. It helped that Brands Hatch GP is such a fantastic circuit to drive when you get into the woods at the back. Hawthorns bend is fast and exciting, and Sheene Curve is exhilarating as you decide how little to back off as you go into the blind crest and ride the kerb. We don't have an official championship in GRDC, and points are not officially counted. However, we all like to count the phantom points and know where we end up, of course. At the race weekend, I qualified 11th of 15 cars, which is the same result as my first race weekend at Rockingham. The track was wet to start, and drying through the session. Tom Golding, our championship leader was taking three seconds off each lap as the track dried. I was taking one second. I wasn't sliding and not risking anything. We need to get three timed laps or we can't race, and we'd already been stopped for a quarter of the 20-minute session by spinners. In both races, I got mugged at the starts as usual, not because of bad starts this time, but because of poor defending on the technical corners on the first laps. I just let competitors go when they make a lunge, and then I lose momentum. Nevertheless, due to others' spins and off-circuit excursions, and a couple of nice overtakes, I regained places and finished 10th in both races. I finally got myself involved in close racing, over the fast parts of the circuit, where you can carry momentum and make overtakes if you like that kind of speedy flow, as opposed to the technical, diving corners. I avoided damage but got a couple of tyre rubs, which seems normal in racing. All season, we have been supporting the British GT Championship. For our final weekend, we were lucky enough to be selected as one of the four races in the TV coverage, broadcast first on the British GT YouTube Channel, and then on Motorsport TV. It brought great satisfaction to the end of the season to see our race with full coverage and commentary. All in all, my first season in motor sport was extremely rewarding and I learned a great deal on a steep learning curve. I finished 10th of 19 in the "championship" and I didn't sustain any major damage or have huge costs for support, track days or tuition. Next year I can concentrate on the tuition to iron out my mistakes and get faster, and do the races I can afford. Race weekends take at least three days, or maybe four days if you have to travel more than 100 miles to the track and do the Friday practice. No matter what you wish for when starting in this game, race success in motor racing is dependent on time and money. The more time you put in, the better you'll be, and that takes money: track days, test days, practice days, time off work, tuition, set-up, and repairs if you take more risk while getting faster. Over the first couple of race weekends, you'll see some drivers improve, others lose interest and others balance expectations. We all do racing for different reasons, and those don't become clear until you really start the competitions. The fast drivers are just the fast drivers up front, and they've probably been carting for years or just have no fear. The ones that improve significantly from track day to first and second race weekends have decided to put more time into practice and tuition, as the lust for not getting overtaken kicks in. Some drivers are perplexed at the level of commitment and money required when everyone else starts to increase the level of seriousness, and they may withdraw from some races. Other drivers become philosophical and realise that they can't increase commitment significantly but will keep trying and be content with the lower end of the results table. Being at the front takes talent and a no-fear constitution. Being near the front takes time and money commitment. All the rest is a compromise and balance of what you want to get out of motor racing. If you're in it for the kudos, put in more money and time to get higher up. If you're in it for the experience and the thrill, set yourself a budget and concentrate on tactics at the race weekend. I don't participate in the Friday practice, due to budget. It costs twice what a track day does and will be run in sessions for the different classes of race car, so you'll typically get two hours of track time over the day. To be quick at a race weekend, you probably need the Friday practice however, to tune into the track and conditions, including other drivers, and to find your level of commitment to risk (i.e. how you're feeling and whether you need to change that). If your head is not in the right place for taking risk and being assertive, you won't be as quick as the other drivers. Friday practice will help with this. But it's not essential... I think you can learn to get your head in the right place during Saturday qualifying, although it's a challenge. On my first race weekend, I had done a track day on the circuit two weeks before, and my first time on race weekend track was qualifying, I got 11th fastest of 18. On my second race weekend, some drivers had improved significantly through tuition, my mood was "beach" not "race track", and I qualified 14th of 17. I can't stress enough the need for commitment, concentration, mood and focus when competing. It's the same in any sport, but particularly the ones where decisions of micro-seconds make a big difference. Qualifying is normally on the Saturday, with a race or two following later in the day, and another race or two on the Sunday. Starts can gain or lose you two or three places compared to qualifying. If you lose places, you'll be chasing slightly slower cars and trying to overtake. This is where things can go wrong for new racers, as you don't know where to make the moves and you try them in the wrong places. In my second race, I lost four places through a spin while overtaking around the outside. 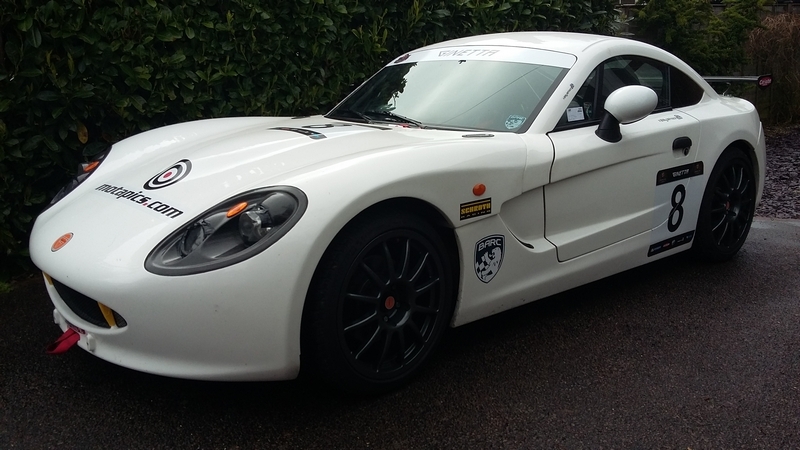 It was close to coming off, but in a Ginetta G40, there's a fine line between maintaining speed and grip, and a spin. Find out from the pros where the overtaking points are on the circuit. They will mostly be obvious, like at the end of a straight, and not into a hairpin after a short straight. Wait until you are at these points, and keep harrying the car in front, to put on pressure. There's a lot more to this than I know about, so I won't write more. What I can comment on is some basic tactics for novice racers. If you're not feeling the speed (i.e. grip and momentum) you can adopt a no-spin tactic of early braking and turn-in, avoiding the risk of spins but compromising your speed further. In other words, don't chase the speed if you're not feeling it. With novice racing in particular, others will spin in front of you or while trying to overtake, and by keeping them behind you as long as possible, you will gain places. This is not particularly rewarding though, so I would recommend finding the speed and having more fun next time! Just a little more on starts: it's important to practice how to get off the line and to think about where to position yourself on the first two corners. I'm not accustomed to dropping the clutch, having driven mostly road cars, but it's the only way to get off the line quickly and not burn the clutch. As for position on the first two corners, I stuck to my plan of "inside line if possible", but found that in a bunch of jostling cars, it is possible for others to overtake you around the outside. So, if you do decide to go for the outside, it does work, as speeds are lower at the start generally. There is also a consideration of how much contact you are prepared to risk. If you avoid contact in your mind, as instinct will dictate after years of road driving, you will lose places to others who have a different attitude. Don't forget to get your race licence Upgrade Card signed at race control! The Upgrade Card is in your MSA Blue Book as a rip-out card, and before going to the event, you'll need to stick a passport photo on it and take it along. The organising club will sign your card after a race, so that you can apply for the next level of licence (National A). You can also remove your novice cross after six signatures. The journey home is slow if you're pulling a trailer and gives you plenty of time to reflect. It's good to think about what you did right, what you did wrong, and most importantly, evaluating why you're doing this, and does it align with why you started in the first place? Are you having fun, and if not, why not?! I'm happy with that. It equates to where I think I should be, considering my input and speed. One thing I've learned about the motorsport world is that everything is last-minute. I'm not sure yet if that's because of the nature of racing or just because accidents and breakages happen, and this throws everyone's plans out, in a domino effect. Or maybe it's just difficult to finance motorsport, and there are simply not enough people going around to do the work. So what do you need to prepare for racing? Here's a simple list. Get your ARDS test and listen to the part about joining the first race carefully (e.g. signing on, scrutineering, entering the track)! And also learn the part about the starting procedures, as you won't get to practice these (unles you join the GRDC, where they give us a practice). Buy your race gear. If you buy as a package in one go, you'll get a discount. You might want to wait a while before buying the HANS device, but make sure you buy a HANS well before the first race, and start to use it on your track days (as it takes practice to adjust to restricted head movement). Join a club, such as BARC or 750 MC, as a racing member. This takes about a week, possibly two to come back. Get hold of your race schedule for the season and book hotels a few months ahead, near the circuit. Think of your graphics / livery and discuss with a wrapping company. Schedule in a date at least a couple of months before the first race. Get hold of the race technical regulations and ask a professional motorsport team to set it up for you (e.g. ride heights, corner weighting, roll bar settings). It should take about 4 or 5 hours at around £60 / hour. Learn from the team how to do a spanner check. After a few track days, you will certainly have some loose bolts, missing clips and clamps, etc. Learn what technicals to check at a track day every time you go out on track, as you will be responsible for these on race day: tyres (set the pressures), fuel (make sure you have enough) and wheels (make sure you have torqued them correctly). Watch some races in your series, and learn the corners, holding area and start procedures. Maybe take some video. Track time is the key to becoming competitive. Even if your natural ability is not as good as a fellow competitor, you will almost certainly get quicker than them if you spend more time in the car. The ARDS (Association of Racing Drivers' Schools) test is the racing licence test sanctioned by the MSA (Motor Sports Association) in the UK. As you progress through motor sport and do more competitions, your licence will also progress through different levels and you will, for example be allowed to compete outside the UK. You can take an ARDS test at most race circuits, including the MSV tracks and Silverstone, where I took mine, as arranged by Ginetta. The test is taken over a period of one day at the circuit. Before going, you'll be given an application pack which includes a DVD (called Go Racing) to explain all you need to know about the test. You can also search on Google and download an old copy of the MSA Blue Book (part of the general rules and regulations) to read about the procedures, flags, and so on that are explained in the DVD. Watch the DVD as many times as you can, and you will absorb all you need to know to pass the theory part of the test. It will also help you with the practical test, as it explains the general principles of speed and of smoothness, accuracy and consistency that the ARDS tester will be looking for. On the test day itself, you'll do two sections: the written test and the practical test. The written test normally comes first, after an introduction session and another viewing of the DVD. The test contains about 20 questions in multiple-choice and written-response format (such as writing down which flag is for which track situation). Each candidate in the test room gets a different set of questions, so there can't be any comparing of answers! The practical test involves a demo run with the instructor, where he shows you the potential speed of the car (normally a front-wheel drive, such as a Clio or Megane) on a race track. I think it's also designed to put you in the right frame of mind, and let you know that you are there to drive fast, and if you're not prepared for that already on the day, you should think about it. These instructors are professional racing drivers, and they can go FAST. The practical test then involves two instruction sessions of about 15 minutes each, after which you'll sit in-car with the instructor and discuss what he sees you doing wrong (and right) and the areas you should concentrate on, such as not blasting the throttle too early before the apex. These sessions are like a mini instruction day, to point out areas where you might spin or go off the circuit, and to educate you on the principle of going fast and urgently on track, and therefore not becoming a hazard. The third practical session is the test itself, and the instructor will ask you to do three or four laps without any input from him / her. They are looking for awareness (mirrors - and you should tell them what you see approaching), control and safety, and a minimum speed around the lap. You don't have to set records on the speed, just drive within your fast ability and with urgency. If you spin or exit the circuit by out-braking yourself, you will fail the test. At the end of the practical test, the instructor will probably tell you in the car if you have passed or failed that part. After this you'll also get the results of your written test. If you pass both, your paper is signed and you can apply for the National B licence. The 750 Motor Club has a clear process document on how to go racing, here: http://www.750mc.co.uk/racing.htm. See also http://timarnold.com/get-your-race-licence and http://www.rebeccaracer.com/ards-first-step-in-to-racing. Compared to motorcycle helmets, availability and models of racing helmets are more specific. You must buy a model with an FIA approval, and they normally come in white, silver or black. It's rare that you'll find a helmet with graphics. I've only seen one Bell model with red / white graphics pre-applied. The helmet will also need HANS posts (locking points on the rear of the shell) because all MSA events in the UK now require the driver to use a HANS neck brace. If you're intending to race, it's best to get accustomed to the HANS device as soon as possible. They are not uncomfortable in my experience, but they do restrict your sideways and rear vision and movement (e.g. for reaching a non-closed passenger door!) because you can't turn your head more than 20 degrees or so, or move your head away from the seat. You will obviously need the five-point harness in the car to use with the HANS device, and all this takes time to set up when you get in the car, so it's best to get comfortable with doing it every time you go out on circuit. I chose a Stilo ST5 Composite helmet (the design for lifting the visor is great), with a Schroeder HANS device (seemed the lightest and best value) and a tinted, iridium visor for those low-sun winter afternoons on track. The iridium visors look dark, but from the inside, they are clear and don't restrict light in my opinion (and you can always leave it up when not wanting the sun shade). I suggest finding a local company that shows pictures of racing cars on its website. There is probably a supplier within 20 miles of you that does this for some race team or other. I was lucky to find Jellyfish Design within two miles, and they do wraps for BTCC and many other race teams. Race cars are mostly wrapped, not painted nowadays, and the design and wrap can cost from £300-500 upwards, including advice on the design. A cheaper option is just to get stickers made up by the same company. You'll need a couple of months to go through the process when it gets close to racing season, so it's best to think about the graphics early if you can. I was caught out by needing factory fixes to the car just when I was planning to send the car to Jellyfish for livery, about a month before the first race, so that was too late. As it stands, the car looked like this (below) just before the first race. You'll notice that you need number boards and possibly windscreen banners from the series sponsors, and those will need to go on top of your graphics. So that's another reason for starting graphics early. I will now have to work around the number boards or get some new ones. I can't stress enough how important it is to get track time in your race car if you want to get fast, particularly for competition. You may not expect to win, but you will want to give a good account of yourself for your own satisfaction, and end up in the position you think you're worthy of. You will know straight away who is faster and slower than you when you go on track days with fellow competitors. It is possible to move ahead of others purely by putting more driving time into the car. With the Ginetta G40 GRDC, this is particularly true because all cars are the same and you have a level playing field upon which to work on your driving, and gain familiarity for when the car is on the limit. No matter what anyone says, I think the G40 is a difficult car to drive, but also extremely rewarding when you learn what NOT to do and how to control the car. The only way to learn this is to put more track miles in and keep pushing. That will involve spins, but fewer as time progresses. Track time is cheapest on public track days, and I have an article on those, here: http://www.saferoncircuit.com/index.php/12-finding-a-uk-track-day. If you're not finding enough time on track, you'll need to put more money into the game unfortunately, and you can go to Test Days, which are eligible for drivers with race licences only. You can find out more about Test Days here: http://www.msv.com/testing.aspx. These days are often run in sessions, and normally on weekdays. Your track time will be limited and it's more expensive, so you have to go there with a specific goal in mind, to work on areas of driving, track-learning or set-up.